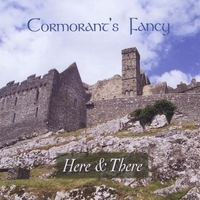 Conveying Celtic music's full range of emotion, Cormorant's Fancy's cross generational lineup brings to life Irish and Scottish traditional music's fervor, joy, pathos, and peace. Venues and reviewers have characterized Cormorant's Fancy as "spellbinding," "with a knack for gorgeous arrangements." Their range, from tenderly passionate love songs to growling soul-stirrers, and from pitch-perfect a cappella to swirling instrumentals, propels audiences into the living Celtic tradition. Cormorant's Fancy's compelling cross-generational lineup unites the past, present and future, so that whether they are stirring the crowd from the festival or concert stage, gracing the parlor, leading the pub in song, or accompanying step dancers, their music rings true. They’ve been called “the area’s most energetic” Celtic band, yet they do it all with finesse! Their their second full-lenght album, you'll laugh out loud, and feel a tear in your eye.You'll hang on every word of an unaccompanied ballad, cheer for a rousing anthem, sigh over a lovely air, and tap your toes to sprightly jigs and reels.